Watching some of the world’s greatest athletes over the past week had me thinking about all of the individual elements that come together for the extraordinary performances we see from these competitors. It’s overwhelming to think about the dedication, commitment and the amount of time these athletes had to put in to get every little step, spin, jump – any move you can think of – just right to win a medal. Now, I’m inspired more than ever because Ford is in a similar position as we pull together our self-driving vehicle business. We’ve spent years researching and developing self-driving technology, studying changing customer behaviors, serving some of the largest fleets in the country with help from our dealers, and working with governments big and small. Now it’s time to pull it all together and head for the finish line! So now, we’re headed to Florida to test and prove out our business model. With the help of Miami-Dade County, we’re taking our service directly to the streets of Miami and Miami Beach. Miami-Dade Mayor Carlos A. Giménez is a champion of innovative technology and applying it to help improve life for residents of the county. He’s on the forefront of thinking about the future of transportation, leading a county that already offers a diverse set of transportation modes ranging from ride-hailing services and rail to buses and bike sharing. He understands the potential of self-driving vehicles and how they can fit in, interact with, and enhance all of those modes and more. That’s why this collaboration makes so much sense. There’s clearly a need for innovation. Miami was recently listed as the 10th most congested city in the world, according to the Inrix Global Traffic Scorecard, and the fifth most congested city in the United States. Miami commuters spend an average of 64 hours in congestion per year during peak time periods?—?or nearly 10 percent of their total drive time. That’s just not right, yet it serves as a reminder that people always need to be at the center of our plan, so we’re setting out to solve for their pain points. 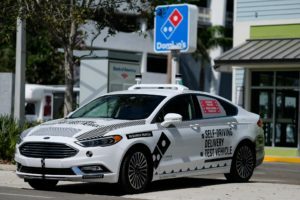 To understand what Miami-Dade residents would experience with self-driving vehicle service, the first part of our presence will involve pilot programs throughout the year with our partners, starting with Domino’s and Postmates. What we learn from this customer experience research will be applied to the design of our purpose-built self-driving vehicle that we plan to launch in 2021 to support the expansion of our service. Before a self-driving vehicle makes a delivery, how will employees stock it and send it off? At the end of its journey, how will customers interact with the vehicle to retrieve their food or groceries, and how far from their homes are they willing to walk to get it? What benefits could and should people get from a self-driving experience? Another way to think about it is to consider the costs of convenience. Today, deliveries can be made to someone’s door, though there is usually an extra charge involved. Oftentimes, drivers illegally double-park when they can’t find a space, potentially causing traffic congestion for others. A self-driving vehicle won’t need to be tipped and it won’t park illegally. So, from the outset we understand there are both hurdles and benefits to self-driving delivery in cities and we intend to learn all of these ins and outs so that we can serve people in a way that’s most intuitive and convenient. Our Domino’s pilot is already up and running in Miami, and we’re finalizing plans to launch one with Postmates in March. In parallel to creating the best customer experience possible, we will continue to develop the self-driving technology powering our vehicles by expanding testing in partnership with Argo AI. 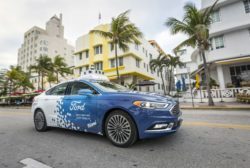 Running a self-driving business in any city requires a comprehensive understanding of local laws and the unique driving habits of residents, which is where Argo specializes. A new fleet of Argo vehicles is already on the streets, mapping the roads and accumulating miles that will help us improve the way they move through cities. The effort will grow throughout the year as we add vehicles and expand areas of testing. Having all these vehicles on the road means we have to face some practical realities too. There’s no doubt in my mind that we will develop fully self-driving vehicles, but one thing we don’t talk about much is the need to take care of the fleet after it spends a long day or night on the road. These vehicles will need to be maintained, repaired and cleaned, including prying sticky gum off the seats. Taking care of a vehicle -whether it drives itself or not – requires space and manpower. That’s why we’re establishing our first autonomous vehicle operations terminal in Miami. Situated close to downtown, it will be the base from which we’ll develop our vehicle management processes and house our test fleet. The vehicles will be washed and have their sensors cleaned here; routine maintenance will be conducted, including troubleshooting problems that arise and more. Additionally, we will work closely with our extensive dealer network in the area, looking for ways to integrate and incorporate their operations and capabilities into our terminal. A healthy dealer network is critical for support, as dealers can help with repairs and conduct parts deliveries and other services. 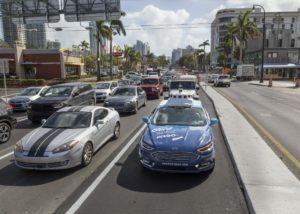 Before thousands of self-driving vehicles can hit the streets, we have to be prepared to manage large, high-tech fleets efficiently, and the steps we’re taking in Miami represent a significant stride in that process. After working out numerous muscles and developing different techniques to navigate a future of self-driving cars, we’re heading onto the stage in Miami-Dade to see how our business performs. By bringing all of our different development tracks together to test in unison, we’re putting ourselves in the best position to analyze our execution, determine what works well and improve what doesn’t. This way, we can quickly expand our service and take it to other cities when the time comes. The development of self-driving vehicles hints at a whole new way of moving people and goods, but it doesn’t change our way of doing business – placing the customer above all else. We’re looking forward to connecting with the people of Miami-Dade County and becoming part of their community as we increase awareness for our efforts and build a service they can confidently rely on day in and day out.